Cloud Renderer is a family of POC add-ins for SOLIDWORKS® and Autodesk® Revit® that enables physically based rendering of 3D models on the Microsoft® Azure® or Amazon Web Services® cloud platforms using LuxRender, physically based and unbiased rendering engine. The DXF/DWG file format is often used as an exchange format between CAD systems. The geometry obtained as a result of exporting from different CAD packages to DXF/DWG often contains broken geometry constraints (i.e., tangent, horizontal, vertical constraints, gaps between points, or overlapping entities). Broken constraints create problems in modeling and manufacturing processes, but it is very difficult to identify all problematic areas manually. 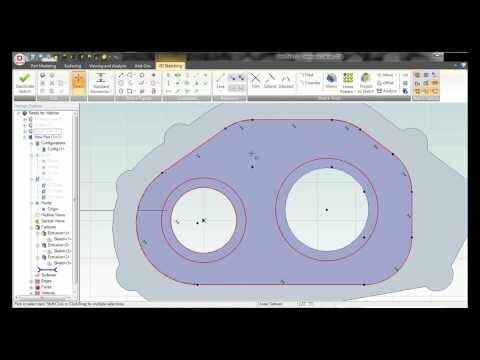 Add-on for Solid Edge® that maps SOLIDWORKS® properties to corresponding Solid Edge properties. Custom and configuration specific document properties in SOLIDWORKS models carry critical design data. Custom and configuration-specific document properties in SOLIDWORKS models carry critical design data. That’s why it’s important for users who are migrating from SOLIDWORKS to Autodesk Inventor to preserve these properties when converting models from one system to another, in addition to recreating the geometry. Currently, there is no automated way to transfer document properties from SOLIDWORKS models to Autodesk Inventor models. MecSoft Corporation, the developer of industry leading CNC software solutions, has announced the availability of VisualCAM 2014 for Geomagic, a major version release for MecSoft's integrated CAM solution for 3D Systems' CAD software, Geomagic Design.